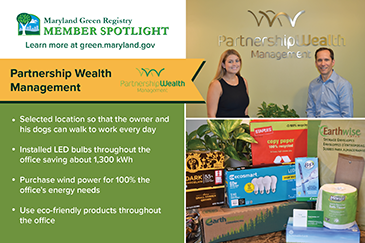 The Maryland Green Registry is a free, voluntary program offering tips and resources to help businesses and other organizations set and meet their own goals on the path to sustainability. 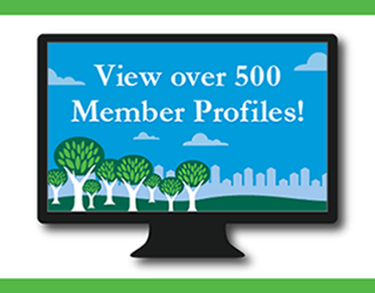 Collectively, Maryland Green Registry members have reported saving over $107 million annually through the proven, practical measures they have shared in their online member profiles. Become a member in three easy steps! Go to the Join Here page to download the member profile form. Share information on at least five environmental practices in place at your facility. Provide a measurable result related to at least one of these practices. 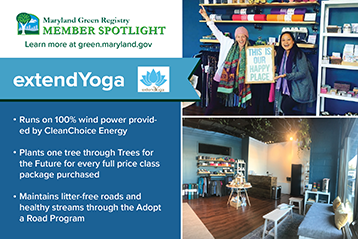 Increased visibility of your organization’s environmental efforts through the Maryland Green Registry website and use of the Maryland Green Registry logo. 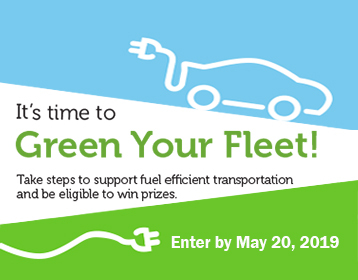 Free information and technical assistance for implementing new environmental best practices. Information on webinars and conferences to help you continue your greening efforts. Recognition and eligibility for the annual Maryland Green Registry Leadership Awards. 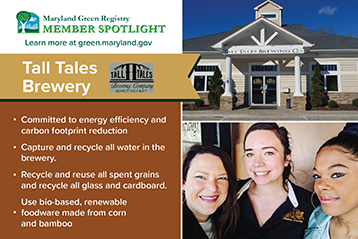 Whether you’re just getting started in greening your facility or are looking to push your environmental program to the next level, join the Maryland Green Registry to demonstrate your commitment to a strong, proactive approach to environmental management.